What is the Best Clinical Evidence for Homeopathy? Answered question from the Debate on Homeopathy. Before presenting the best clinical evidence for homeopathy, it is necessary to address some of the implications attached to your question. First, your question implies that homeopathy addresses indications, as it is understood in conventional medicine. It would be a logical fallacy to answer your question without further clarifying this point. Second, it is implied that we have a mutual understanding of what constitutes homeopathy. Third, by “the best clinical evidence,” it is implied that evidence for homeopathy has been evaluated through a grading system. Let’s first look at the implication that homeopathy addresses indications, as it is understood in conventional medicine. It is very important to understand that homeopathy approaches patients quite differently than it is commonly done in conventional medicine. Typically in conventional medicine, a particular drug having a particular effect will be prescribed to address “a well-defined patho-physiological disease” 1) (WPD). Homeopathy presents a completely different clinical paradigm, as any one of the better-known 550 homeopathic remedies could be prescribed to a patient presenting with a WPD, as long as the remedy’s well-known pathogenesis is found to be most similar to the totality of the characteristic symptoms (TCS) of the patient. This totality is obtained by assembling all the subjective and objective symptoms manifested since the onset of an acute or chronic disease, as well as all the concomitant circumstances associated with them. The most similar remedy, also called simillimum, is prescribed in an optimal posology (potency, repetition and mode of administration), which is monitored and adjusted at every visit by the homeopathic physician. In the absence of a satisfactory response after taking a remedy, the posology is either changed or the search of a remedy with a higher degree of similarity is resumed. This process is continued until the patient begins responding favorably to a remedy. As the TCS will greatly change during the course of successful homeopathic treatment, the prescribed remedy will occasionally be replaced by a more similar one. The remedy and the posology are therefore constantly individualized during the course of genuine homeopathic treatment. This process of constant individualization is an art that takes many years of diligent study and practice to master. To better illustrate the practice of homeopathy, let me briefly describe how it is applied in a patient with an acute disease, e.g., pneumonia. The homeopathic physician will first seek to obtain all the symptoms that have developed since the onset of pneumonia, including the characteristic aspects of the chills, fever, sweat, malaise, cough, sputum, respiration, thirst, appetite, energy, moods, sleep, etc., to which will be added the results obtained from physical examination (auscultation, percussion, pulse, respiratory rate, temperature, complexion, tongue, etc. ), x-rays, other laboratory findings, reports from attendants, friends and closed relatives, and all the pertinent circumstances related to the development of pneumonia in this patient, e.g., exposure to cold wet weather during a period of particularly high emotional stress. As in about fifty percent of the cases, the remedy that corresponds best to the acute state of pneumonia is the same as the one that corresponds best to the underlying chronic state of the patient, it will be preferable for the homeopathic physician to also obtain all the symptoms that existed prior to the onset of the acute disease. From this TCS, the simillimum is chosen and administered in an optimal posolgy, and the patient’s response to the remedy is monitored within a few hours. In the absence of a positive response, the case is re-evaluated, and either the posology is changed, or a remedy with a higher degree of similarity is sought after to replace the previous prescription. This process is continued until a favorable response is obtained, following which the posology is evaluated and adjusted at each follow-up visit. If there is a change of picture, the case is re-evaluated to see if a more suitable remedy should now be prescribed in order to complete the cure. This process of searching for the simillimum and the constant optimization of the posology is continued until the patient has fully recovered. In the case of a patient with a chronic disease, e.g., having rheumatoid arthritis (RA) as the WPD, the homeopathic physician must gather the TCS pertinent to the case since the onset of the disease, which would include the characteristic aspects of the pain and joint inflammation, all the factors and circumstances (weather, temperature, time of the day, menses, stress, etc.) that can affect the symptoms for the better or the worse, all the concomitant symptoms (e.g., insomnia, appetite changes and irritability with the pain), all the other concomitant complaints (e.g., recurrent headaches, seasonal allergies, recurrent herpes infection, warts, onychomycosis, etc. ), the past medical history, the family history, the pertinent aspects of lifestyle and environment, the susceptibility to influences, temperament, disposition, sensitivities and personality of the patient, as well as characteristic aspects of sleep, appetite, thirst, digestion, menses, energy, etc., and reports from attendants, friends and closed relatives. As in homeopathy we always address the entire person and expect from an effective treatment changes on the mental, emotional and physical levels of the patient, it will be a logical fallacy to assume that we address indications defined as WPDs. As an example to better illustrate this point, I recently saw a patient with Parkinson’s disease (PD), who, aside from the common symptoms of PD, was also complaining of depression, insomnia, extreme fatigue and hypoglycemia. In conventional medicine, two or more drugs would have been prescribed in such a patient. However, he was treated with only one remedy to address this chronic state of dysregulation, and on his follow-up visit all of his five chronic complaints had improved under the same remedy as if it was one complaint. In allopathy,2) patients with many chronic complaints will be prescribed a number of drugs. For instance, a patient with RA who also has depression, insomnia and gastric reflux will likely be prescribed one or more medications for each of these four complaints, and perhaps other medications to counteract the side effects of some of them. In homeopathy, one single remedy would be prescribed to such a patient. This approach illustrates well the classic saying, “Homeopathy treats patients, not diseases,” and the classic principle of medicine, Tolle causam, which stipulates that the physician must a priori address the causes and not the symptoms of diseases. In allopathy, patients are primarily categorized and labeled according to their WPDs, while in homeopathy patients are individualized according to their acute or chronic general state of dysregulation. From a diagnostic point of view, the focus in homeopathy is on the derangement of health of the whole person, which forms a unity, and from a therapeutic outcome point of view, the focus is on the restoration of health of the entire person, which forms another unity. In the above cases, PD and RA are not considered “the” chronic disease of these patients but only one of many manifestations of a general state of dysregulation unique to each of these individuals, which we will never see again in any other patient, and which doesn’t need to receive any particular nosological label. In allopathy, drugs are prescribed for their physiological effects, which are short in duration, and there is therefore the need to repeat them one or more times daily. The organism’s regulating power submits to the crude doses. In homeopathy, remedies are prescribed in order to trigger a general healing response, also referred to as an allostatic response of the whole person (ARWP).3) 4) The organism is here activated, and is the actor of the healing process, which is characterized by durable changes. As healing can only come from the living, self-regulating organism, allopathic treatments tend to be palliative while the homeopathic treatment tends to be curative. Qualitative and quantitative manifestations of this ARWP will be used as guides by the homeopathic physician to adjust treatment until full recovery occurs. Also, once the patient’s reaction to the remedy becomes clear to the clinician, necessary lifestyle and environmental changes and health optimization practices will be recommended throughout the course of homeopathic treatment, as disturbances of health primarily related to lifestyle and environmental factors and influences will only be partially or not at all improved following an ARWP. 5) We can summarize by saying that indications addressed in homeopathy are not WPDs, as it is understood in conventional medicine, but acute or chronic states of dysregulation represented by a TCS particular to each individual patient. This is the reality of homeopathic practice, however, for the purpose of communication, when discussing results or prognosis, homeopaths will refer to the treatment of patients with pneumonia, RA, PD, etc. The second implication contained in your question suggests that we have a mutual understanding of what constitutes homeopathy, which would be quite a rarity to find within the academic, scientific or conventional medical communities. A clear, unmistakable understanding of what constitutes genuine homeopathy must be established prior to any serious discussion on homeopathy. It is important to understand that homeopathy was progressively developed on a purely scientific basis during more than fifty years of meticulous experimentation by Hahnemann, and has since continued to be perfected by practitioners who follow the same rigorous methodology. Hahnemann had clearly defined homeopathy, and whose long definition I included in my first post-debate question to you. Also it is important to note that there is no guarantee that anyone who professes to be a homeopath is actually practicing genuine homeopathy, and, if so, it would be at an undefined level of expertise that can be anywhere from apprenticeship to great mastery. Also, experience shows that most research published in peer-reviewed journals and professing to be on homeopathy is actually not about genuine homeopathy. For instance, David Reilly from Glasgow began to research homeopathy to disprove it. He did a series of experimentations with patients with hay fever and their response to an ultra-molecular preparation (UMP) of pollen. 6) 7) 8) 9) The model was very similar to the allopathic model of one drug (an UPM of pollen) for a WPD (hay fever). Despite the fact that his research was not about homeopathy, the titles of his articles still bear the name of homeopathy, and they are generally cited as research in homeopathy. The TCS in these experimentations was not considered, and the remedy and the posology were not individualized. It should simply be classified as research with an (isopathic) UMP, which obviously should never be confused with homeopathy. Such gross misrepresentations are extremely common even in the supposedly highest academic circles, as it was for instance in the Shang et al. high-impact meta-analysis published in the Lancet in 2005.10) Researchers from the universities of Berne, Bristol and Zurich reported having analyzed eight trials of homeopathy. However on close examination, we find that six of the eight trials11) they choose for their final analysis were actually not testing homeopathy, but some gross misrepresentations of it. In the other two of the eight trials, 12) individualized remedies were given but the posology was not individualized. In fact, none of the eight studies represent the principles and practice of genuine homeopathy, in which the remedies and the posology are individualized for every patient at each visit. The peer reviewers of the Lancet did not notice these blatant misrepresentations of homeopathy, and its editors went as far as entitling their editorial, The End of Homoeopathy.13) This incredibly bad science circulated through the media and academic circles around the world without having since been recognized as being flawed analyses or of being retracted by any the many authors, peer reviewers and editors involved, despite a lapse of time of almost eight-years. Skeptics who claim to be the champions of science-based medicine should at the very least alert academia and the public of such unscientific, misleading and damaging information about homeopathy. Permit me to go a step further to illustrate how deeply embedded is this tendency to misrepresent homeopathy in academic circles. Edzard Ernst, the first professor to obtain a university chair in complementary medicine, has published numerous reviews and systematic reviews on homeopathy. In one of his latest systematic reviews, entitled Homeopathy: What Does the “Best” Evidence Tell Us,14) he reviewed the six review articles 15) on homeopathy published by the Cochrane Collaboration working group. In total, these six review articles analyzed 25 randomized controlled trials (RCTs), of which twenty were testing gross misrepresentations of homeopathy, including two with isopathic remedies, six with remedy complexes, and eleven others with non-individualized remedies. In the five other studies, the remedies were individualized but in only three of these was the posology also individualized. To leave no doubt regarding the great travesty of this paper, one of the cases reported to have had experienced “adverse events directly related to homeopathy” had originally been published in the New England Journal of Medicine in 1986 and was about a man who had taken 100 “Regeneration Tablets” containing “a mixture of 19 ingredients.”20) The fact that the authors and reviewers of this article, and the editors of one of the most prestigious peer-reviewed journals associated this case with homeopathy is another evidence of the great confusion and ignorance existing in academic circles about homeopathy. Quite a long stretch of imagination was needed to associate this case with homeopathy. Likely the only patient, who had been treated with genuine homeopathy in these 1,140 cases reported by Ernst et al. as having experienced “adverse events directly related to homeopathy,” was a 62 year-old man with angina. He was a smoker and drinker who, five years earlier, had been successfully treated with homeopathy for epilepsy, and began experiencing chest pain while under stress. An EKG showed signs of ST ischemia. He then resumed homeopathic treatment and his angina disappeared. Eight years later, he returned to his homeopathic physician with blood in his urine. He was then referred to a urologist for a complete urologic diagnostic work-up, and was soon diagnosed with cancer of the bladder. On the one hand, he received radiotherapy, and on the other hand, he responded well to homeopathy for the alleviation of the side effects of radiotherapy. 21) However to ascribe the development first, of angina and second, of cancer of the bladder to having received prior homeopathic treatment is a complete aberration, and is another example of the extremely bad science that circulates in academic circles about homeopathy and can even find its way not only into prestigious peer-reviewed journals, but can be repeatedly quoted by other researchers, peer reviewers, editors and the Cochrane Collaboration without ever being recognized as flawed and or of being retracted. It is necessary that the methodology of any trial pertaining to be about homeopathy be closely examined to make sure that it is truly representative of genuine homeopathy. Any misrepresentation of homeopathy in research is not only an incredible waste of time and resources but is shamefully delaying the course of medical science. When research is about UMPs, complex remedies or isopathy for example, researchers should simply state it in order that these other methods are not confused with homeopathy. Aside from the crucial aspect of having a truly representative and precisely applied methodology in trials conducted under the name of homeopathy, I will address another point that is very important to consider in any discussion about trials of homeopathy, namely that all trials with only one-known exception equally measure the skills of the practicing physicians and the efficacy of homeopathy. Clinical successes in homeopathy are entirely dependent on the capacity of the treating homeopathic physicians to rigorously apply the practical rules of homeopathy. It takes many years of assiduous study and practice to be able to obtain consistent and predictable good results. Also, as the ARWP is a process that continues as long as homeopathic treatment is pursued, a sufficient amount of time must be allowed in order to appreciate its full effect. Is the methodology truly representative of genuine homeopathy? Was the methodology applied in a skillful and learned manner by experienced homeopathic clinicians? Was the proper amount of time allowed to observe the full effect of the intervention? The practice of homeopathy can’t at all be viewed as a uniformly applied treatment that is based on WPDs, as it is generally done in conventional medicine. No prescription in homeopathy is routine, as the TCS must be meticulously obtained and exactly individualized in all cases, and, thus, all trials evaluate the art of the physician. The greater is the mastery of this art, the more predictable will be the results, and the greater will be the outcome of the trial. The third implication of your question entails that the evidence for homeopathy has been fully and properly evaluated through a grading system, similar to the ones used today in evidence-based medicine (EBM). EBM requires that physicians integrate the best available clinical evidence into practice. 24) In conventional medicine, it consists of an unceasing process of evaluation of the efficacy and effectiveness of a particular intervention for a particular WPD. The evaluation of the clinical evidence for homeopathy is a completely different process, as it is unnecessary and irrelevant to know whether a particular remedy has ever been used in a particular WPD. It is homeopathy’s fundamental principle (the principle of similarity) and its practical rules that must instead be satisfactorily verified, which, in essence, consists in verifying whether homeopathy works or not. Homeopathy should be considered as a single intervention representing the principle of similarity, whose therapeutic focus is not on any particular WPD but on the general state of dysregulation particular to each patient. Physicians typically become seriously interested in homeopathy after having conducted, like true scientists, a therapeutic trial usually in a patient with an unfavorable prognosis, and become completely surprised by the promptness, gentleness and unexpectedness of the recovery. To clearly illustrate this point, I will now give you a few examples of men of science and of great intellect who approached homeopathy with much skepticism, but who had remained at the same time sufficiently open to experiment and become surprised, as true scientists should be. In the early 1820s, Hahnemann was obliged to leave Leipzig to escape the prosecutions of physicians and pharmacists, and it was thus expected that homeopathy would die out, but, as it did not, a major medical publisher intended to kill it, and asked a staunch opponent of homeopathy and professor of surgery at the university to write a book against homeopathy. Dr. Robbi, the surgeon in question, from lack of time recommended his assistant, as “the very best man to do the job,” as he had a brilliant scientific mind. His name was Constantine Hering. This induced the young Hering to experiment, and in the course of two years, he became, step by step, more and more convinced of the truth of all the practical rules of homeopathy. At this point in time, he developed a dissection wound, which, under the treatment of his teachers, reached such a degree of severity that amputation of the hand was advised. At the suggestion of a friend, who was a student of homeopathy, the efficacy of the potentized drug was tried. The result was a complete cure of the wound, which led to a thorough conversion of Hering. Astonished by the results, the book was discontinued and Hering dedicated the next 58 years of his professional life to homeopathy. Now put yourself in the situation of Des Quidi, let’s say one of your loved ones is on their deathbed and all avenues of conventional medicine have been exhausted: who would now hesitate to consult a learned and experienced homeopathic physician who was highly recommended? Who would let preconceived ideas have precedence over pure experimentation, like the legend tells of the inquisitor Aristotelian philosophers who refused to look into Galileo telescope to see the moons of Jupiter? This is the crossroad where staunch skeptics blinded with passion and true scientists depart from each others. “It was not however till afterwards, when I saw sleep, bloom, strength return and manifest a general state of health unknown for twenty years, that I really comprehended the whole truth, the whole power of homeopathy; for, to what else could a cure so long unlooked for be attributed? “The power of imagination, to which so many persons ascribe every thing which they have no other mode of accounting for, was easily satisfied. “Nature? I prayed for nothing better; but nothing had indicated to me the period of her awakening, nothing taught me why nature had delayed for twenty years to come to my aid until the precise day and hour when the homeopathic treatment was commenced. “From exclusion to exclusion, I always fell back to homeopathy. But atoms! Nothing!—The elixir of LeRoy, spider's web, any of the arcana, and the celebrated nostrums of the day would have put me greatly at my ease; all are something; almost all have great energy, producing some striking results which explain their transient credit; but millionths of a grain—what can they do? “Yet how to get rid of the facts? I unavoidably concluded with the admission that a new fact, though incredible to me, was nevertheless a fact, and that the measure of my ideas was a little short of the powers of nature and the discoveries of genius. Dr. Benjamin Franklin Joslin Sr. graduated in medicine in 1826 from the College of Physicians and Surgeons in New York City and, aside from practicing medicine, held the chair of mathematics and natural sciences, and lectured on anatomy and physiology at Union College, and later at the University of the City of New York. He published regularly in scientific and philosophical journals, and was known as a man of science. In 1839, he dissolved his partnership with his colleague Dr. B. F. Bowers when this one adopted homeopathy, as Joslin was prejudiced against it. Soon afterwards, Joslin was asked to write an attack against homeopathy. Unwilling to publish an opinion not founded on knowledge, he relinquished the request and instead determined to give homeopathy a trial. “When this record was completed, I examined a printed list of symptoms, and was surprised to find a remarkable coincidence between them and those I had experienced. I at first thought it probably an accidental coincidence. “I repeated the medicine, and again found a coincidence equally striking. Another medicine was then tried, with similar precautions and similar results. There was a new set of symptoms, very different from the former, but generally corresponding with the printed symptoms of the last medicine taken. “Thus the evidence accumulated from week to week, until I became thoroughly convinced that such a number of coincidences could not, on the theory of probabilities, be accidental. “There were thousands of chances to one against such a supposition. I knew that the attenuated medicines were efficient, and the homeopathic materia medica, so far as I had tested it, substantially true. “The incredibility of the power of the small doses and of the attenuations had been my greatest stumbling block. This being removed by actual and direct experiment, I felt confidence in Hahnemann, and justified in making therapeutic experiments to test his grand law of healing. Hering, Boenninghausen, Des Guidi, Wesselhoeft, Joslin and Dunham were all men of science with great intellect and were all leaders of men; all were skeptical about homeopathy; all were surprised by the results of their first experiment, which gave them sufficient courage and confidence to go against tradition and to continue experimenting; all eventually became convinced of the unmistakable phenomena of the potentized remedies after repeated experimentation, usually over a period of two or more years, and all practiced homeopathy until their last day. As this self-satisfactory level of evidence may not be satisfactory to everyone, I will now move closer to the central idea of your question. Unfortunately, the best clinical evidence for homeopathy has not been fully and properly evaluated, as most of its evidence is still lying dormant in its vast literature, in case reports, cohort studies, official reports from boards of health, hospitals, insurance companies and state prisons, orphanages and mental asylums. It must therefore be understood a priori that any discussion about the best clinical evidence for homeopathy is based on a partial review of the existing evidence until more complete systematic reviews become available. Contrary to allopathy, in which each drug must first be evaluated for its efficacy in each WPD and then for its own effectiveness (relative risks and benefits), homeopathy must be viewed as one intervention (the clinical application of the principle of similarity with all its practical rules), regardless of the remedy or potency used, and whether one or more remedies or potencies were used during the course of treatment of a patient with an acute or chronic condition. The full evaluation of the evidence for homeopathy would be an extremely complex process, particularly because of the shear mass of information on the effect of an entire system of therapeutic that has been practiced all over the world by hundreds of thousands of physicians with different levels of competence for more than two hundred years, and which has been reported in over 25,000 volumes of literature in a number of different languages. To do justice to homeopathy, the majority of this evidence should be evaluated in order to arrive at a more exact estimate of all aspects of its short and long-term real-world effectiveness. However, this will have to wait until more in depth systematic reviews of large portions of its currently un-appraised evidence are completed. Also in the evaluation of this evidence, it does not help that hierarchies of evidence of EBM were not developed with the perspective of processing, evaluating and integrating such enormous masses of information. A more appropriate hierarchy of evidence will likely need to be developed by scientists to fulfill this necessity, but this will also have to wait. However, let’s proceed forward by evaluating the best-known evidence within the current EBM standards. One of the main purposes of science in general and EBM in particular is to establish cause-and-effect relationships among numerous variables. By minimizing bias and confounding factors, a well-designed, and meticulously applied RCT, the gold-standard for evaluating the efficacy of an intervention, should be able to simply answer whether there is a causal-relationship between the well-applied principle of similarity and the restoration of health. However, the broader and necessary questions of effectiveness (relative risks and benefits), costs, appropriateness, etc. will unlikely find their answers in RCT studies, which are more appropriate for strictly testing efficacy. We can’t utilize the great majority of the RCTs purporting to test homeopathy, as we have seen that most of them misrepresent homeopathy, each having their own list of methodological shortcomings. There are many RCTs about UMPs, which are valuable to demonstrate the efficacy of their biological “activity,” but they can’t be used to represent homeopathy. Most of the in vitro and plant research I mentioned during the debate were about the efficacy of UMPs to affect living organisms. However, not all RCTs professed to test homeopathy have been misguided or are misguiding. Indeed, Bell et al. published a series of papers on a double-blind, randomized, parallel-group, placebo-controlled trial of the treatment of patients with fibromyalgia accompanied with a sub-study of quantitative EEG recordings. This well-conducted trial is important as it shows correlation of the subjective improvement (pain) with objective changes (EEG). A total of 53 of 62 patients completed the 4 months study up to the optional crossover phase (14.5% dropout rate). The primary reasons for the nine dropouts related to time and travel demands of the study, or excessive experience of scalp pain during EEG laboratory hook-up procedures. Dropout rates and baseline patient demographic characteristics of dropouts did not differ between active and placebo groups. The 3-month ratings on the Patient Satisfaction Scale did not differ between groups. Both groups progressed comparably. Essentially, true clinical responders to homeopathic remedies could not only be identified through subjective reports of tender points and global health improvements, but also objectively through their EEG responses. Consistent with the homeopaths’ possible perception of a lack of expected improvements over time and consequent decisions to change remedy selections for placebo-treated patients, the average number of remedies recommended by the homeopaths was significantly higher in the placebo group (P=0.023). The active group exhibited a significantly greater improvement in tender point count and tender point pain on palpation, in the Appraisal of Fibromyalgia Scores, in quality of life and in Global Health Ratings, and with trends toward lower Profile of Mood States (POMS) depression, POMS anger–hostility and McGill Affective Pain scores compared with placebo at 3 months. Right prefrontal cordance findings correlated with subsequently reduced pain and trait absorption. I mentioned earlier that trials of homeopathy equally measure the skills of the practicing homeopathic physicians and the efficacy of homeopathy, but with only one known exception. The experiment in which the greatest attempt was made to dissociate efficacy of these two equally distributed factors was the trial of Frei et al., which is therefore of great interest. I already referred to this unique trial during the debate, which entails the treatment of children with ADHD. Prior to the randomized, double-blind, placebo controlled crossover part of the trial, all children were first treated with homeopathy to find out the specific remedy each child responded to. The sample size was calculated for the Conners’ Global Index (CGI), the primary endpoint in the crossover trial. To have a 5% significance level and a 95% statistical power, 27 patients were required in each treatment arm, or a total of about 50–60 patients. After a mean of 5 months, 70 out of 83 children had obtained a satisfactory response to a (individualized) homeopathic remedy by having achieved an improvement of 50% or more on the CGI. 8 had inadequate response and 5 were non-compliant. Of these 70 compliant responders, 62 children (5 refused to participate in the trial and 3 became eligible by being too late to enter the second phase of the trial) entered the second phase of the trial that was a randomized, double-blind, placebo controlled crossover trial. Among these 62 children, the ones who developed acute diseases, incurred serious accidents or experienced severe social changes in their life during the crossover part of the trial were not assessed for all endpoints and were considered dropouts. However, they were still included in the primary endpoint analysis according to the intention-to-treat principle. The double-blind part of the study consisted of two parallel arms. In Arm A, the children received verum (V) for six weeks followed by placebo (P) for six weeks (Arm A: VP). In Arm B, the children received a placebo for six weeks followed by verum for six weeks (Arm B: PV). Finally, both arms received another six weeks of open label treatment (Arm A: VPV and Arm B: PVV) and an additional long-term follow-up under treatment with a mean of 19 months (range of 10-30 months). Relatively long, six-week crossover periods were chosen since a carry-over effect may be an obstacle for a crossover trial. From experience gained in a previous trial,37) this duration was thus considered long enough to diminish this problem. No wash-out period was therefore incorporated between the two crossover periods. At the beginning of the trial and after each crossover period, the parents reported the CGI and the children underwent neuropsychological testing. The CGI rating was again evaluated at the end of each crossover period and twice in long-term follow-up. At entry to the crossover trial, cognitive performance such as visual global perception, impulsivity and divided attention had improved significantly under open label treatment (P<0.0001). During the crossover trial, CGI parent–ratings and resistance to verbal interference in the VLMT 38) were significantly better under verum by an average of 1.67 points (P =0.0479) and 11.27 points (P=0.0328) respectively than under placebo. At the end of the crossover period two, ADHD symptoms decreased in children receiving verum (CGI 9, range 3–19) while children on placebo still had a high CGI (12, range 4–21). Also, at the end of the 6 weeks of open label treatment following part two of the crossover trial, the ADHD symptoms of both treatment groups had returned to around their values at beginning of the crossover trial (8, range 2–16 in arm A vs. 8, range 2–21 in arm B). The median CGI of the 62 children had therefore dropped significantly from 19 (range 15–25) at treatment start to 8 (range 2– 16), 6 weeks after the crossover trial. The period effect referring to within-patient mean difference between entry and end of the crossover part of the trial was significantly better for verum for stability of moods (P<0.0001) and reaction to unexpected events (P=0.0003). Comparison of the Conners’ Parent Rating Scale scores between start of treatment and 14 weeks after the crossover trial still revealed highly significant improvements in all subscales, in both mothers’ and fathers’ ratings: behavior (P=0.0001), learning/attention (P =0.0001), psychosomatics (P=0.0004), impulsivity/hyperactivity (P=0.0001), (P=0.0001), shyness/anxiety (P=0.0001), and CGI ( P=0.0001). Also, the Conner’s Teachers Ratings Scale showed a significant improvement of behavior (P=0.0347). I mentioned earlier that the researchers of this study attempted to isolate the efficacy of homeopathy from the one of the homeopaths’ prescribing skills. However, as homeopathy requests constant individualization of both the remedy and its posology at each visit, it would actually be almost impossible to design a RCT in order to completely dissociate the efficacy of the physician versus the efficacy of homeopathy without greatly compromising the way homeopathy is practiced and, more particularly, its outcome. The RCT study design was certainly not designed to test an intervention like homeopathy in which the physician ongoing decision-making is evaluated, as well as the efficacy of the principle of similarity and its many practical rules. In the case of Frei et al., the homeopathic pediatricians had no more contact with the children or their parents during the eighteen weeks of the cross-over and the following open-label parts of the trial, and where therefore unable to know whether some children needed a change of remedy and, most likely, an adjustment of posology during that period. This was a major limitation of this study, which is not uncommon with RCTs’ internal validity rigorous requirements, and was therefore not a faithful reflection of actual practice, as it would be expected that the best indicated remedy would have needed to be changed in certain children during the eighteen weeks following the beginning of the cross-over period of the trial, and an even more likely probability during the mean 19 months of the entire treatment period. This means that a certain number of children likely received remedies that were only partially or not at all helping them anymore once the cross-over period of the trial had began. Also, details on the frequency at which the posology was adjusted during the course of the open label periods that preceded and followed the 12 weeks of the crossover part of the trial are not at all not mentioned. Another limitation of this RCT, as in most RCTs, is the imposed time-frame limit. It is important to realize that in order to observe the full effectiveness of homeopathy in a chronic condition like AHDH, a 19-month mean limit is only showing what is possible with homeopathy on a relatively short term in patients with chronic diseases. In this study it took an average of five months to find 70 responders among 83 children. This prescribing accuracy within this time-range is a measure of the qualifications of these treating homeopathic physicians, which illustrates again that the application of the science of homeopathy is an art. It is also important to mention that it is much easier to find the initial simillimum a patient needs than any of the succeeding simillima that may be required during the course of treatment that may last many years in patients with chronic diseases. Again, the great mastery in the art of prescribing becomes crucial for guiding a patient most efficaciously to complete recovery. 25% of this 19-month mean time of treatment was used to find the initial remedy each child needed. However, once the “correct” remedy is found and the ARWP is obtained, patients with chronic diseases who are treated with genuine homeopathy typically experience a progressive health improvement year after year, which would definitively apply to children with ADHD. This cumulative, overall improvement in patients with chronic diseases from year to year is generally unseen in conventional medicine, and would unlikely be noticeable in a short-term RCT. Despite all these limitations, the final assessment (median duration of treatment 19 months, range 10–30 months: early entry into the trial led to longer follow-up times), 53 children reached a median CGI of 7 points (range 2–15), or a 12-points improvement, corresponding to an overall improvement of 63% ( P <0.0001). As the above two well-designed RCTs conclusively show the efficacy of homeopathy, we can now move beyond efficacy studies and look at effectiveness studies. However, let’s first briefly address the skeptics’ bias argument of setting aside all studies that are not high internal validity RCTs. As physicians, we must use the best treatment in any given case, and as patients, we want access to it. Knowing now that homeopathy works is fundamental to clinical decision-making but not sufficient. In order to make an enlightened decision on the best therapeutic approach for instance in ADHD children, parents and health care providers need to be aware of the actual complete and long-term outcome of homeopathic treatment versus other approaches such as Ritalin. It is important to point out that effectiveness studies are typically carried out under the conditions of clinical practice and have thus high external validity and ensure more clinically representative results than can be obtained by the more rigid structure of the RCT design. During the debate, I presented two representative, large-scale, long-term, prospective observational studies,54) 55) a summary of observational studies, 56) a systematic review of most of the clinical trials of homeopathy published between 1821 and 1998,57) a health technology assessment commissioned by the Swiss government,58) a summary of the partially assessed epidemiological evidence, which as a whole show homeopathy to be safe and cost-effective, but above all they disclose a very consistent and strong therapeutic effect and real-world, long-term effectiveness of homeopathy. Anyone taking the time to seriously search the homeopathic literature will most likely at first be stunned by the mass of effectiveness studies such as controlled cohort studies, observational studies and outcomes studies from official reports from hospitals, boards of health, insurance companies, and state orphanages, prisons and mental asylums. Secondly, as stunning will also be the robustness and magnitude of the effect and the significance of the outcome contained in them. Additionally, there is another very rich field of evidence for homeopathy that wasn’t addressed during the debate, which is contained in the innumerable case reports often of patients on their deathbed experiencing quick and totally unexpected recovery. To give an idea of the shear mass of cases contained in the homeopathic literature, summaries of close to 3,800 cases published before 1840, when homeopathy was still in its infancy, have been assembled in a nine volume series.59) Since 1840, the number of cases has likely increased by 50 to 100 fold. Perhaps ten percent of these cases document, by all means, extraordinary outcomes of patients with very serious diseases. In conventional medicine, a great proportion of cases that show clear and sudden changes toward recovery during the course of very serious and/or stubborn diseases soon after initiation of treatment tend to indicate new directions in research and treatment, and establish new prognostic expectations. Despite the fact that the homeopathic literature is very rich in such cases, the scientific community as a whole has remained indifferent to homeopathy. I will now illustrate the value of evidence provided by single case studies with a few examples in cases presenting with very serious acute diseases ( e.g., rabies, meningitis) and in a case with a stubborn, unremitting chronic disease (PD). The information they provide can’t be easily obtained through RCTs, partly because of the rarity of some these conditions (rabies), or the need for the long-term treatment (6 or more years) in order to be able to better appreciate the entire effectiveness scope of homeopathy. Many cases of clinical rabies in both animals and humans and experimental rabies have been reported to have fully recovered under homeopathic treatment. By clinical rabies, it is typically meant that an animal with an abnormal behavior, usually a stray dog, comes into a village located in an area in which rabies is known to be endemic, and, unprovoked, bites a number of animals and persons. Within a couple of weeks some of the bitten animals develop abnormal behaviors, are put in isolation, eventually develop the full unmistakable manifestations of furious rabies, and are killed. Some weeks later, one of the bitten persons develops general malaise with heightened redness, swelling and unusual sensation at the site of the bite, which are followed within a few days by spasms, especially when swallowing, hydrophobia, and convulsions. A physician, usually an allopath, is called in, who in turn calls in other colleagues as consultants. The spasms, hydrophobia and the convulsions become progressively more severe. From the history and the symptomatology, they all concur without any doubt in their minds that the patient has hydrophobia and is thus incurable. As a last resort they try various nostrums but in vain, and the patient is now in a state of almost constant convulsions and is on the verge of dying. Typically a priest, a distant family member or a friend suggests calling in extremis a homeopath, who is called in with great reluctance. This one comes, examines the patient, concurs with the diagnosis, and administers a homeopathic remedy. Within a short period of time, the spasms and convulsions begin to diminish in intensity, duration and frequency. The remedy is repeated as needed. The patient becomes more restful, falls into a deep and prolonged sleep, and eventually becomes capable of drinking without experiencing any spasms or convulsions. A convalescent period, typically of two to three weeks, follows with a progressive recuperation of strength, after which the patient seems completely recovered subjectively and objectively. I will now only give the summary of a typical case, of which the author, Dr. Anastasio Alvarez Gonzalez of Madrid, said that the diagnosis of rabies in the case he published with great details was as certain as it was possible to ascertain. Around the middle of April 1864, Mrs. Torcuato Guevara of Madrid, the 28-year-old wife of a Spanish army officer, had received the visit of a lady, who was accompanied by her female dog. A few days later this dog disappeared from the home of her master without anyone ever knowing what happened to her. On April 22, the dog of Mrs. Guevara that had been in contact with the visiting dog became uneasy and sad. He avoided caresses and light. Instead he sought out corners, changed places often and hid under furniture. He appeared fearful and was holding his head between his front legs and chest. He wasn’t eating much but was drinking often. He remained this way until April 25 when he became more fearful and that night wandered through the house. With its hackles up, he began to continuously and strangely bark, which would end in a short howling. Early that morning, he lightly bit the tip of the fourth finger of Mrs. Guevara 4-year-old daughter who was trying to play with him. While she was screaming, the dog went at once hiding under her bed. A servant who tried to have the dog come out from under the bed was also lightly bitten. Both bites were superficial and without any blood shed. The dog continued to growl until his mealtime, when Mrs. Guevara took him out from under the couch and while she was holding and caressing him, he suddenly bit her right thumb deeply at the level of her interphalangeal joint. Nothing much had been so far thought about these erratic behaviors, despite the fact the dog had been drooling since April 22. The dog began then running in all directions throughout the house. His eyes were injected and extremely brilliant. He tried to jump though glass doors and finally found an open window and fled. The head of the house understood at once that the dog was rabid and ordered that he be pursued and be killed, which was done. During the succeeding eight days, Mrs. Guevara experienced pain in her right hand, which extended to her shoulder, and was at times experienced in her left arm. She was left afterward with only heaviness and malaise. Mrs. Guevara who was then four months pregnant consulted eleven of the best physicians of Madrid to see if anything could be done to prevent the development of rabies. She was only told that nothing certain was known to be efficacious, but tried the various suggestions they had to offer. Three weeks after having been bitten, she woke up from sleep in a state of extreme restlessness with hallucinations of numerable shining glows. She was experiencing a very intense headache with heat of the face and eyes and cold extremities, pain in her limbs without being able to flex them, loss of appetite, sleeplessness and startling with frightening thoughts that came as she would fall asleep. She was in a state of constant restlessness and terror. She was sad and preferred to be left alone. All her senses, especially her sight, were acute. Her hallucinations were worse when she looked at water, crystal or any shining object. The clock at her bedside had to be removed for this reason. She felt in her throat, as if she was being strangulated by a tourniquet, and oppression of her chest, which greatly limited her capacity to breathe. These sensations were preceded by a burning heat in her chest and throat. She was extremely thirsty but could not come to drink, especially plain water. However, she was able to drink beer with lesser struggle. Several allopathic physicians were consulted. The last one recommended to the family that the patient be sent to the San Carlos College where she would be treated with outmost care. She refused to leave home. On the thirty-first day after the bite, she woke up at night in a jerk and in a state of suffocation with violent convulsions and loud screams. This attack lasted four minutes. Similar fits continued throughout the night between periods of total calmness. Eventually the fits lead to states of unconsciousness during which she would try to bite. Another prominent allopathic physician was then called in who said that medicine had no effective treatment now that the patient had entered the second stage of rabies. The only resort left was to send her to the hospital. The couple refused again to be separated. This last physician still tried various medicines. In the following twenty-four hours, the fits continued to be more frequent and to last longer. Eventually, Abbot Hilario Guerrero, the grand sacristan of San Francisco and Grande Parish, was called in to administer the last rites. Seeing her in this deplorable state the abbot suggested that a homeopathic physician should instead be called. Mrs. Guevara answered that she had no confidence in homeopathy as her cousin, Mr. Sagasti, the governor of Madrid, had died while under homeopathic treatment. The priest respected her opinion but impressed her husband sufficiently that as a last resort a homeopathic physician should be called, as no allopathic physician would now accept to treat her unless she was in the hospital. She finally acquiesced to be seen by a homeopathic physician. Abbot Guerrero called on Dr. Gonzalez, and pleaded with him “for the sake of humanity,” to care for this patient with declared rabies. At 3 p.m. on May 29, Dr. Gonzalez found the patient in a state of unconsciousness, as an extremely violent fit had just ended. Her face was inflamed with the expression of terror, despite her eyes being closed. She was cold to touch and her limbs were in tetany. She eventually regained consciousness and greeted the new doctor. She was surprised by his thorough examination. Her eyes were completely injected. Her mouth and enlarged tongue were completely coated, as if macerated by thick and viscid saliva. The mucous membrane under her tongue was inflamed with two confluent ganglions underneath. The wound on her right hand was sensitive to the slight touch. Mrs. Guevara who was alert said that she was experiencing an intense burning sensation in her chest and throat with great difficulty breathing and that the sight of water made the throat constriction much worse. When she tried to drink water she would experience not only a very distressing internal convulsion but also burning heat in her mouth and chest. Any noise, music, shining object or shimmer of light would trigger fits of uncontrolled fury. A slight draft would increase the burning in her chest, the difficulty breathing and would trigger shaking fits with palpitation. She wanted silence and to be in a dark room. She was experiencing soreness throughout her body as if was broken. She couldn’t move her legs. She couldn’t eat and had barely slept in 12 days. She was in despair of recovery, but was at the same time resolute that she was going to die, and was now only waiting for God to come and take her. After completing his detailed examination of the patient, Dr. Gonzalez went into the next room to prepare a half glass of water with seven pellets of a homeopathic remedy in the 200 potency. He returned to the room hiding the glass and asking her to keep her eyes closed. While her husband held her head down, Dr. Gonzalez covered her eyes with his hand, and gave her half a teaspoon of the solution, which triggered a fit with suffocation and convulsions with a bright red face and injected eyes, which was followed by unconsciousness and the desire to bite. An hour later, he gave her a second dose, which triggered a similar fit. He then left with the instruction to give her a third dose in another hour, being satisfied that he had done all he could for the moment. The next day, Dr. Gonzalez returned to find the patient in a very happy, greeting mood when she saw him. After his departure on the previous day, she was given a third dose of the remedy and she had a similar fit as after the first two doses but shorter and with less desire to bite. Her state of terror progressively diminished during the rest of the day, and the night was calmer. She was able to sleep even though she kept being interrupted by jerking and frightful dreams. She continued to improve until the following morning (May 31), when around seven o’clock she went into a biting fit that lasted 45 minutes. Dr. Gonzalez was called and he found her in a state of constant restlessness, trying to escape, having great difficulty breathing and with tetanic convulsions. Her limbs were now extremely cold. She was experiencing coldness ascending from her lower limbs to her mid-chest where it met a burning sensation that had now worsened and was extending to her throat. When this heat would extend to her head, she would choke until she would faint. Her jaw and lips were tight and her eyes were closed shut. She uttered frightening sound with inability to breathe, as if she had great chest pain. Her screams would get longer, as the fits would peak. During the fits, the muscles of her face would alternately contract and relax; she would then open her eyes, which were injected, shiny and fixed with an expression of furor but without being able to see. Her face was again inflamed. In her state of unconsciousness, she would convulsively open her mouth followed by the desire to bite anything she could find. After three minutes of intense furor, she would slowly calm down but would continue to moan but less loudly. The same remedy was again given and was repeated every three hours. She was better by the evening when Dr. Gonzalez decided to test her by making a new preparation of the remedy in water before her. This provoked a fit but of a lesser intensity as compared to the previous days when she was trying to escape at the sound or sight of water. She eventually passed a good night. She had only one mild dream. By the next morning (June 1), she was feeling much better. The remedy was continued now every six hours. She continued to improve but began to cry non-stop for no reason in the following twelve hours. From then on, she improved daily. She remained weak mentally and physically, and her body was sore for some days. She would startle when she heard or saw a dog. All her symptoms eventually disappeared to full recovery. In a scientific (unbiased) system of medicine, the consistency of the response and the magnitude of the effect in desperate cases as the one above should have great significance and therefore initiate great interest, and more particularly when serious work done with experimental rabies in animals supports beyond a reasonable doubt the curability of rabid persons with homeopathy. Dr. Edmond Plantureux, a French military veterinarian, was head of the microbiology department at the Pasteur Institute in Alger during the middle half of the twentieth century, and published numerous works on rabies. In 1925, he developed an anti-rabies prophylactic vaccine for dogs that would be used for the following 30 years. In 1942, Plantureux made a number of experiments by producing rabies in healthy dogs and rabbits by injecting them with brain extracts of animals that had died of rabies. These injections were either intracerebral, intraocular, or intralingual and/or intralabial. One hundred percent of the animals that received the intracerebral injection developed the most severe type of rabies. One hundred percent of the animals that received the introcular injections developed rabies but of a somewhat less severe type. Between 50-70 percent of the ones that received intralingual and/or intralabial injections developed rabies. Dr. Plantureux acknowledged making various experiments with homeopathic dilutions for prophylactic and therapeutic purposes, but with little knowledge of homeopathy and with no one to guide him. He was able to observe complete protection from rabies in only a few animals. However, one of the most revealing outcomes of his work is that, out of about 300 rabid dogs, 35 were cured while all of the 158 controls, “without an exception,” died of rabies. None of the ones that received an intracerebral injection survived, but 10 of the ones that received an intraocular injection were cured, and 23 of the ones that received an intralingual and/or intralabial injection were cured. The two other dogs that were cured of rabies had the furious form (not the paralytic form) of rabies, which had been acquired in nature. To verify that the recovered dogs had really been cured of rabies, four to five months later, he re-injected them with intraocular or intracerebral injections of the rabies virus. All the control developed rabies but none of the cured animals showed any sign of rabies. He kept the cured dogs under observation for up to 2 years. Also, he would inject into the brain of healthy rabbits brain extract taken from all the cured dogs once they would die. None of the rabbits had any reaction to these injections after more than 3 months of observation proving without a doubt that these dogs had been really cured of rabies. The prophylactic approach would have to be started all over again but this time by producing rabies with less severe introduction of the rabies virus than by the intracerebral, intraocular or intralingual/intralabial way, as it is a well-known fact that rabies occurs more frequently, more rapidly and more severely the closer to the brain is the introduction of the virus. These experimental findings are consistent with the clinical data, and provide greater strength to the evidence of the curability of rabid animals and humans by homeopathy. Let’s now look at two examples of dramatic recovery in patients who were in the last stage of AIDS and meningitis. Late on the evening of Tuesday November 3, 1987, I received a phone call from a nurse who was asking if homeopathy could help an AIDS patient imminently dying in the ICU of the Toronto General Hospital. This 37-year-old man began experiencing a full relapse of pneumocystic carinii pneumonia two days after having been released from two weeks of hospitalization. After another two weeks of IV antibiotics, he developed acute cryptococcal meningitis, a very insidious and often fatal form of meningitis. Two antifungal drugs, flucytosine was given orally and amphotericin B was given IV, both in increasing doses, as he was not responding. 100 mg of prednisone was added to counteract the severe adverse effects of these two antifungal drugs, which the patient experienced as severe headaches, nausea, vomiting, cramps, spasms, chills, fever, photophobia and general weakness. In the following week, the patient’s condition continued to deteriorate. He was vomiting several times a day a green-brownish vomitus, and developed pitting edema in both legs with persistent kidney pains (nephrotoxicity and kidney failure are among the more serious adverse effects of amphotericin B). His liver became enlarged and tender (hepatitis and acute hepatic injury are among the more serious adverse effects of flucytosine). His hemoglobin level had dropped to 6.0 and his potassium level at 2.7 (N: 3.5.-5 mmol/L). The pain he was experiencing was so severe that morphine was finally administered and his attending physicians notified his friends that the patient was not responding to treatment and they should expect the worst in the coming days. A remedy was prescribed on the phone that evening, which could only be obtained the next day from a pharmacy located near the hospital. Within 15 minutes of receiving the homeopathic remedy, he began showing signs of improvement. His recovery continued almost uninterrupted from the moment he began homeopathic treatment. Homeopathic treatment was revaluated and adjusted from one to four times a day depending on the various complications experienced by the patient. As he eventually regained consciousness, he requested that morphine and then prednisone be stopped. On Thursday November 19, he notified his physicians that he wanted to leave the hospital. However, he was persuaded by these physicians to first have an examination of his CFS before leaving. As it was still positive for the presence of Cryptococcus, he was emphatically told that for certain the meningitis would return within 24 hours and he would quickly succumb from it. On Friday afternoon, he signed a waiver about leaving the hospital against medical advice, and left all allopathic medications behind. At about 11 the next morning, I received a call informing me that the patient woke up with a severe headache, pronounced nuchal rigidity, great incoordination and much confusion. He was prescribed a remedy fitting this presenting picture. He responded quickly and recovered completely from the meningitis and the lingering pneumonia that had remained in the background. In the following three months, he regained the 25 pounds he had lost during the previous acute illness. In May 1988, or seven months after initiation of the homeopathic treatment, he left my care symptomless to return to his country of origin in Asia. Let’s now look at another case of dramatic and unexpected recovery, which also commenced the moment homeopathic treatment was instituted. On May 29, 2003, I received a phone call again late in the evening from a friend of a 30-year-old woman who was dying in the ICU of the Montreal General Hospital from major complications associated with Neisseria meningitides meningitis, namely septic shock, acute respiratory distress syndrome, complete anuria with pre-renal failure, liver failure, myocardial depression, bone marrow ischemia with consequent anemia (Hg: 8.8) and thrombocytopenia (Pl: 14), purpura fulminans, and disseminated intravascular coagulation. Earlier that evening, her family and friends present at the hospital had been notified that they expected her to have less than 2 days to live. Within half-hour, at 10:30 that evening, I was visiting the patient in the ICU, who was in a comatose state. Her body was completely covered with large purpural patches and petechiae with about one centimeter between each other. The distal part of all her fingers and the four lateral toes of her left foot had turned black and some of them were necrotic. She also had several large, 3-10 cm, gangrenous patches throughout her body. This gangrenous process had been quickly progressing in the last 36 hours. Her face was waxy and so swollen that her eyes were wide open, rolled upward, bulging and completely injected. She had no pupillary or corneal reflexes. Her mouth was also wide open with her tongue protruding to one side. Beside the petechiae and purpura, the base of her skin was grayish-blue, giving her the overall appearance of a monster akin to the ones kids tend to spontaneously draw. She was completely flaccid and toneless, and was irresponsive to pain and speech. The Babinsky response was present on her left foot and no plantar response could be elicited on her right foot. Her arms were tied down as, earlier in the day, she had episodes of restlessness. The left side of her body was cool while the right side was warm. She had not produced any urine since her admission to the hospital three days ago. Her CSF lactic acid level had been steadily climbing to now 21 mmol/L (N: 0.5-3.2 mmol/L). She was on a respirator, and on continuous dialysis. She was on a number of drugs, including antibiotics, steroids, dobutalamine and activated protein C (thrombin antagonist). She had already received blood and platelet transfusions. Her prognosis had not been favorable from the beginning because of the speed at which she became unconscious, the great number of petechial lesions, the purpura fulminans, the septicemia and the absence of normal reflexes. The textbook says, “The greater the number of asymmetric extremity and truncal petechiae, the less likely that the patient will survive,”64) and her body was completely covered with them. Her physicians had told the family that nothing more could be done than to wait. After examining the unconscious patient, I obtained relevant information from the attending nurses, the chief of staff, members of her family, and her friend and boyfriend. Shortly after 11 that night, she was prescribed a homeopathic remedy to be administered every hour throughout the night until they would report back to me the next morning. At 9 a.m., it was reported, “She seemed to have changed after the first dose.” Overall, she has had more color in her face, her mouth is less widely open and her tongue protrudes less. This morning she responded to light and mildly to speech, and she could feel a squeeze of her right hand. Her eyes were less injected and less bulging, and were more closed when resting. Last night, she produced a small quantity of urine for the first time since her admission now four days ago. The frequency of the respirator assistance level had been lowered from 25 to 10. The CSF lactic acid level had dropped overnight from 21 to 9 mmol/L. The black discoloration and gangrenous process of her digits and skin seemed to have stopped progressing. There were more pink coloration in her toes. During the following 12 weeks of her hospitalization, she was prescribed six different homeopathic remedies in different potencies to address different complications she was then experiencing. The first remedy prescribed to her, which was on the night of May 29, was eventually resumed after her hospitalization in late August, and was continued in ascending potencies until March 2004. Her recovery was progressive, uninterrupted and complete. On June 24, she saw a hand surgeon who suggested amputation of the tips of five of her fingers. She refused the operation. From July 19 to 29, she gained 4 pounds, from 87 to 91 pounds. She weighted 110 pounds before her sickness. By August 13, 2003, the nails and distal phalanges of her right fifth finger and of her left first and fifth toes started to grow back. By August 22, 2003, the nails and distal phalanges of her right third and fourth fingers had started to grow. By October 1, 2003, she had gained 6 more pounds, from 91 to 97 pounds. All the swelling of her fingers and toes had abated. The tips of her fingers and toes had continued to grow and were becoming more full. The hard, dried-up tips of her digits were shrinking and were being pushed away by the new growth of tissues. The skin at the edge of the gangrenous parts was becoming very healthy. By December 2, 2003, her strength had continued to improve and was now up to 80% from normal. Her weight had climbed to 103-104 pounds. By January 9, 2004, her physical strength and stamina were 95% from normal. Her energy was up to 9-9.5 out of 10. She still required a lot of sleep, about 10-12 hours per night. Her fingernails and distal phalanges were still growing. Her skin continued to improve. Her weight was 105-107 pounds. Her appetite was 80-85% from normal. She saw a plastic surgeon of the hand who recommended clipping the tiny dried up fingertips in about a month from now. On February 10, 2004, she had the hand surgery. By April 14, 2004, she reported not having needed to repeat her homeopathic remedy in the last six weeks. Her sleep was down to 8 hours per night. She had started exercising 4 times per week for 1 1/2 hours per session. She had resumed her full time employment as a physiotherapist for the Cirque du Soleil. All the nails and distal phalanges of her previously gangrenous digits had grown to about 90-95% of their original sizes. Let me now illustrate the value of single case studies in the long-term treatment of patients with chronic diseases known to be unremitting. In November 2001, a 45 year-old musician and conductor began experiencing progressive balance problem, postural changes, stiffness and clumsiness in his left hand. In February 2002, he was diagnosed with PD and was started on Sinemet. He soon experienced a 50% improvement of his symptoms. The neurologist suggested discontinuing Sinemet after 20 days for diagnostic purpose, which was positive as his condition relapsed completely. In August 2002, the diagnosis of PD Hoen and Yahr stage 1 was confirmed at the movement disorders department of the Rush-Presbytherian-St-Luke’s Medical Centre in Chicago. In December 2005, he began taking ropinirole (Requip), as all his symptoms had slowly worsened since the onset of the first symptoms in 2001, despite many lifestyle changes (including organic foods and yoga) and alternative treatments. In November 2006, he developed a tremor with increasing clumsiness and stiffness in his left hand, which was now preventing him from playing piano and conducting. The limp in his left leg had become more pronounced. Stooping was progressively getting worse and his left arm had stopped swinging while walking. In December 2006, Sinemet was added to the ropinerole he had already been taking for one year. From 2003 to 2007, he had tried homeopathy but unfortunately to no avail. He had been prescribed seven different remedies from two different homeopathic physicians. He was referred to me in November 2006, and I saw him in February 2007. He was then losing his balance 15-20 times a day especially when turning in close spaces. By the end of the day, his left shoulder and upper arm were stiffer and he wrote with greater difficulty and in very small characters. He was now finding himself drooling throughout the day. He had been experiencing for the last 2-3 years sleeplessness after 3 to 5 in the morning. He had been experiencing for the last 18 months shortness of breath with anxiety. After a thorough examination, he was prescribed a remedy that he continued taking in ascending potencies until December 2010. A second remedy was then prescribed in ascending potencies until July 2012. A third remedy was then prescribed in ascending potencies until now. In the last 6-plus years, since the beginning of homeopathic treatment under my care, progressive improvement was not reported in only three monthly reports. He can now play piano without any difficulties and can conduct without any signs of PD. In May 2012, he conducted in Washington D.C. five two-hour performances in four days, without any difficulties or showing any signs of having PD. He can now skip doses of his allopathic medications without any worsening of his symptoms. To assume a priori, this patient must not have real PD but suffers instead from a similar condition that can spontaneously remit, would be an easy way to escape the obligation to seriously investigate the phenomenon, as any responsible and courageous scientist would do. The unique and surprising outcomes obtained in these acute and chronic cases are not only very convincing regarding the efficacy and the effectiveness of homeopathy, but provide prognostic perspectives unknown to conventional medicine. Thousands of such cases of recovery from the same intervention should be sufficient evidence for authorities to seriously investigate the effectiveness of such an intervention. The fact that the worldwide research budget for homeopathy is less than $2 million annually, or 1/100,000 of the worldwide $200 plus billion budget for biomedical research, clearly shows that homeopathy remains medicine and science best kept secret. It is clear to the unbiased mind that recovery began in all the above cases at the very precise moment the homeopathic intervention was started. The fact that a very large number of such cases have been reported in the homeopathic literature should stimulate great interest in scientific minds, and entice people to consider genuine homeopathy at the very least in cases presenting with very serious and/or life-threatening illnesses and unfavorable prognoses. It is ironic that any intervention in conventional medicine demonstrating a fraction of the ranges of effectiveness reported for homeopathy would attract limitless attention, and would turn the research world around particularly if there were great financial incentives for the medical-industrial complex. On the other hand, homeopathy is continually and automatically being dismissed in people minds since a huge negative prejudice was stamped on it in the 1830s, which was actually based on completely false premises and flawed evidence. Ever since generation after generation of skeptics have been repeating the same arguments without ever taking the time to look at the original facts. Homeopathy had to be a sham, as like magic its reported results were too good to be true. As I mentioned in the debate, likely the most compelling evidence for the effectiveness homeopathy is found in its extensive records in times of epidemics. In 2003, I began reviewing the literature on this subject, and I have so far uncovered over 7,000 references of which the first 2,000 have been incorporated into a comprehensive text that is now over two thousand pages. All the epidemics, in which homeopathy has been involved since 1797, have been included in this extensive review of the literature. The main finding of this research is that results obtained by homeopathy during epidemics reveal a very important and clear constancy, which is a very low mortality rate. This constancy remains, regardless of the physician, time, place or type of epidemical disease, including diseases carrying a very high mortality rate, such as cholera, smallpox, diphtheria, typhoid fever, yellow fever and pneumonia. Hierarchies of evidence of EBM have not been developed with the perspective of integrating such massive amounts of evidence, as the allopathic literature prior to WWII is relatively poor in valuable therapeutic interventions. Aside from a small number of trials, such as the ones of Lind’s with citrus in sailors with scurvy (1747), and Louis’ with bleeding and expectancy in patients with pneumonia (1828), there are not many astounding therapeutic trials that are worth recounting, or whose therapeutic interventions would have any clinical significance today. However, this is not at all the case with homeopathy, whose literature overflows with all types of very meaningful case studies, trials and outcome reports that remain as pertinent today as when they were first published. Results obtained by homeopathy don’t really lose any of their value with the passing of time, and are like all facts as relevant as if they had occurred today. The practice of homeopathy is based on two series of independent phenomena, namely the symptoms observed during proving of a medicine and the presenting symptoms of a patient, which are connected by the homeopathic physician through the principle of similarity. The symptoms that disappeared with certainty under the influence of a remedy are called cured symptoms, and are integrated into the materia medica with the pathogenetic symptoms. They form the basis of the homeopathic materia medica, which is cumulative in nature and never stops being relevant like any natural science that is based on the study of phenomena. Expert opinion thus plays an important role in homeopathy to establish prognoses, and clinical experience, being cumulative, becomes more refined from one generation to another. A review of expert opinions in homeopathy would provide completely new perspectives on prognoses and on the practice of medicine in general. Incidentally, it is a strange fact how detractors of homeopathy rely so much on expert opinion when they recognize it to be the least valuable level of evidence. From earlier time until now, professed experts on homeopathy, whom skeptics have relied on, have been found to be shams and/or the evidence they advanced against homeopathy have been shown to be flawed, like we have seen above with the French Academy of Medicine, Holmes, Shang et al., the Lancet editors, Edzard Ernst, etc. Odds ratios and relative risks with two-by-two tables are often sufficient to fully appreciate the effect size of these outcome studies. As an example, let’s now look at the outcomes of homeopathy versus allopathy in patients with pneumonia before and since the introduction of antibiotics. It is generally agreed that hospital patients with pneumonia tend to be as a whole more advanced and difficult cases, as pointed out by Dr. Jas. Railey of New York, “A few years ago we were gathering our statistics at the Metropolitan [Homeopathic Hospital] and a friend said to me, ‘This is quite a different thing from private practice in families.’ Dr. [G. Harlan] Wells and some of us treat in hospitals and private cases, and it is like Dr. Jekyll and Mr. Hyde.”88) It could easily be argued by a stranger to this literature that the difference in outcomes could perhaps be explained by the fact that allopathic hospitals received more sick patients than homeopathic hospitals. There is no evidence to this argument, and to the contrary, it is common to find in the literature allusions that allopaths would send their moribund patients to homeopathic hospitals, likely in order to transfer the blame. Also, such an argument is not really meaningful as critical cases of pneumonia respond almost just as well to homeopathy as the non-critical cases. Dr. G. Harlan Wells, professor of clinical medicine at the Hahnemann Medical College in Philadelphia, examined the records of the Hahnemann Hospital between 1906 and 1921 for the outcomes of patients with lobar pneumonia that were treated, depending of the attending physician, either with only homeopathy or only allopathy or with a mix of allopathy and homeopathy. The mortality varied among the ten staff doctors from 0% to 37.5%. Out of 190 patients who were treated exclusively with homeopathy, 14 died, a mortality of 7.4%. Three members of the staff had zero mortality. Out of 153 cases that were treated exclusively with allopathy there were 92 deaths, a mortality rate of 60%. The 3.4% mortality rate in patients with pneumonia ascribed to homeopathy represents the tabulated average from all the cases and cohort series with 5 or more patients treated with different levels of expertise that has so far been found in the homeopathic literature. In no way does it represent the best results that can be obtained by genuine homeopathy. In 1885, the venerable Dr. P. P. Wells of Brooklyn commented that a death rate of even 2 or 3 percent is still too high under “right” homeopathy and gives the example of Dr. Reiss, who in his practice between 1843 to 1848 in the hospital of Linz, Austria, had a 1 percent mortality rate. He continues, “We believe this because we have the proof of this in our own experience. In a practice of this system which reaches forty-three and two-thirds years, which most of the time has been very large, and of a general character as to the diseases treated, of which, no doubt, pneumonia has made an average part, I have not lost one case.”92) Pneumonia was quite common in the days of Dr. Wells, just by the fact that many acute diseases, common to his time and place, such as influenza, diphtheria, measles, rubella, whooping cough, typhus and typhoid fever, would often end up in pneumonia. If we assume that he saw at the very minimum one patient a month with pneumonia during his career, he would have had no deaths in well over 500 cases. Wells’ success is corroborated by the present author’s experience. In over 30 years of private practice that include over 180 cases with pneumonia, some of which were treated on their deathbed, having failed under allopathy, there has not been a single death under homeopathic treatment. It is in fact hard to imagine a person dying of pneumonia under genuine homeopathic treatment, even in the worst of circumstances and for whom all hopes had been given up, whether it is infants or children in the last stage of viral pneumonia, a 99-year-old woman in a very weakened state, patients with advanced lung cancer or a comatose patient in the last stage of AIDS. However, four million people will continue to die every year of pneumonia until more efficacious treatment is sought after or is requested by the tired victims of the politics of medicine. Pneumonia remains today a major health concern that has been increasingly getting worse in the last few decades. Let’s now examine the outcome of pneumonia patients under contemporary conventional care (CCC), which benefits from advances in nursing care such as hydration and oxygenation that would be positive confounding factors not present in the last two sets of statistics (PAA and homeopathy). Pneumonia is today divided in two main categories, namely community-acquired pneumonia (CAP) and health-care-acquired pneumonia (HCAP), and their statistics are as a rule kept separate. The odds of surviving CAP are 28 to 1 with homeopathy, were 3 to 1 with PAA, and are today 6 to 1 with CCC. The relative risk of dying from CAP was 7.1 (95% CI 6.7 to 7.6), or 7 times greater with PAA than with homeopathy (P < 0.0001). The relative risk of dying from CAP is today 4.03 (95% CI 3.75 to 4.32), or 4 times greater with CCC than with homeopathy (P < 0.0001). The odds ratios of surviving pneumonia with homeopathy were 9.1 (95% CI 8.48 to 9.73), as compared with PAA (P < 0.0001), and would today be 4.5 (95% CI 4.2 to 4.9), as compared with CCC (P < 0.0001). The second part of the answer to Dr. Steven Novella’s first question will follow in June. 1) Steven Novella. Homeopathy: Great Medicine or Dangerous Pseudoscience? UConn Medical Center, March 22, 2013. 2) The words “allopathy” and “homeopathy” were invented by Hahnemann. Contrary to popular beliefs, allopathy is not in essence a pejorative word, however its practice has been associated with the dangers of an understandably, despised high iatrogenicity. Both words come from Greek roots, alloios pathos, meaning a dissimilar affection, and homoios pathos, meaning a similar affection, to clearly differentiate two drastic ways of prescribing medicines—the first one being based on empiricism or theory, and the later one being exclusively based on the principle of similarity. A medicine becomes homeopathic only when it is prescribed on the principle of similarity between the symptoms it can produce in healthy persons and the symptoms experienced by a sick person. When a medicine is prescribed on any other principle than the principle of similarity it is then referred to being allopathic. 3) Ilia N. Karatsoreos, Bruce S. McEwen. Psychobiological allostasis: resistance, resilience and vulnerability. Trends in Cognitive Sciences 2011; 15 (12): 576-584. 4) Iris R. Bell, Mary Koithan. A model for homeopathic remedy effects: low dose nanoparticles, allostatic cross-adaptation, and time-dependent sensitization in a complex adaptive system. BMC Complementary and Alternative Medicine 2012; 12 (1): 191. 5) Lifestyle and environmental changes include diet for well-being and longevity, mental and physical exercises, adequate sleep and rest, fresh air and sun, stress management, and dealing with emotional and spiritual issues. 6) David Taylor Reilly, M. A. Taylor. Potent placebo or potency? A proposed study model with initial findings using homoeopathically prepared pollens in hay fever. British Homoeopathic Journal 1985; 74: 65-75. 7) David Taylor Reilly, et al. Is homoeopathy a placebo response? Controlled trial of homoeopathic potency, with pollen in hayfever as model. Lancet 1986; 328 (8512): 881-886. 8) David Taylor Reilly, et al. Is evidence for homoeopathy reproducible? Lancet 1994; 344 (8937): 1601-1606. 9) Morag A Taylor, et al. Randomised controlled trial of homoeopathy versus placebo in perennial allergic rhinitis with overview of four trial series. British Medical Journal 2000; 321 (7259): 471-476. 10) Aijing Shang, et al. Are the clinical effects of homoeopathy placebo effects? Comparative study of placebo-controlled trials of homoeopathy and allopathy. Lancet 2005; 366 (9487): 726-732. 11) 1- Papp et al 1998: Flu prevention/Oscillococcinum; 2- Rottey et al. 1995: Flu prevention/Mucoccinum; 3- Weiser and Clasen 1994: Sinusitis/Complex remedy; 4- Labrecque et al. 1992: Plantar warts/ Polypharmacy: Thuja 30 C, Antimonium crudum 7 C and Nitricum acidum 7 C; 5- Vickers et al. 1998: Prophylaxis of soreness in runners/Arnica 30 C; 6- Schmidt and Ostermayr 2002: Support during fasting/Thyroidinum 30 C.
12) 1- J. Jacobs, et al. Acute diarrhea in children: (limited to the use of 19 medicines) Statistically significant (p<0.023 and p<0.036). 2- H. Walach, et al. 1997: Headache. Not statistically significant. 13) Editorial. The end of homeopathy. Lancet 2005; 366: 690. 14) Edzard Ernst. Homeopathy: what does the “best” evidence tell us. Medical Journal of Australia 2010; 192 (8): 458-460. 15) 1- S. Kassab, et al. Homeopathic medicines for adverse effects of cancer treatments. Cochrane Database of Systematic Reviews 2009; 2- M. Heirs, M. E. Dean. Homeopathy for attention deficit/hyperactivity disorder or hyperkinetic disorder. Cochrane Database of Systematic Reviews 2007; 3- K. Linde, K. A. Jobst. Homeopathy for chronic asthma. The Cochrane Library (1998); 4- R. McCarney, et al. Homeopathy for dementia. Cochrane Database of Systematic Reviews 2003; 1; 5- A. J. Vickers, C. Smith. Homeopathic Oscillococcinum for preventing and treating influenza and influenza-like syndrome (Review). Cochrane Database of Systematic Reviews 2006; 3; 6- C. A. Smith. Homoeopathy for induction of labour. Cochrane Database of Systematic Reviews 2003; 4. 16) David K. Cundiff. Evidence-based medicine and the Cochrane Collaboration on trial. Medscape General Medicine 2007; 9 (2): 56. 17) Kirstin Borgerson. Valuing evidence: bias and the evidence hierarchy of evidence-based medicine. Perspectives in Biology and Medicine 2009; 52 (2): 218-233. 18) P. Posadzki, A. Alotaibi, E. Ernst. Adverse effects of homeopathy: a systematic review of published case reports and case series. International journal of clinical practice 2012; 66 (12): 1178-1188. 19) M-A. von Mach, et al. Intoxikationen mit Medikamenten im Kindesalter bei einem regionalen Giftinformationszentrum. Klinische Pädiatrie 2005; 218(1): 31-33. 20) Harry D. Kerr, Garland W. Yarborough. Pancreatitis following ingestion of a homeopathic preparation. New England Journal of Medicine 1986; 314 (25): 1642. 21) Alfons Geukens. Two more case histories. Journal of the American Institute of Homeopathy 2001; 94: 93-105. 22) Graham Jackson. Homeopathic medicine. International Journal of Clinical Practice 2013; 67: 385. 23) P. P. Wells. Addresses, etc. Homoeopathic Physician 1885; 5: 414. 24) David L. Sackett, et al. Evidence based medicine: what it is and what it isn't. British Medical Journal 1996; 312 (7023): 71-72. 25) Samuel Hahnemann. “Nota Bene for My Reviewers.” In Materia Medica Pura. Translated by R. E. Dudgeon. Vol. 2. (Liverpool and London: The Hahnemann Publishing House, 1880), 2. 26) Clemens von Boenninghausen. In T. L. Bradford’s The Pioneers of Homoeopathy. (Philadelphia: Boericke & Tafel, 1897), 167-191. 27) Sebastien Des Guidi. Letter to the Physicians of France on Homoeopathy. Translated from the French by William Channing. New York: Monson Bancroft, 1834. 28) W. P. Wesselhoeft. Some Reminiscences. Proceedings of the International Hahnemannian Association 1907: 23-43. 29) Benjamin Franklin Joslin. Evidences of the Power of Small Doses and Attenuated Medicines. Nashua, N.H.: Murray & Kimball, 1848. 30) Carroll Dunham. Observations on Lachesis. American Homoeopathic Review 1863-64; 4: 29-33. 31) N. C. Hill, Lise Frappier-Davignon, Brenda Morrison. The periodic health examination. Canadian Medical Association Journal 1979; 121: 1193-1254. 33) Kenneth F. Schulz, David A. Grimes. Sample size calculations in randomised trials: mandatory and mystical. Lancet 2005; 365 (9467): 1348-1353. 34) Iris R. Bell, et al. Improved clinical status in fibromyalgia patients treated with individualized homeopathic remedies versus placebo. Rheumatology 2004; 43 (5): 577-582. 35) Iris R. Bell, et al. EEG alpha sensitization in individualized homeopathic treatment of fibromyalgia. International Journal of Neuroscience 2004; 114 (9): 1195-1220. 36) Iris R. Bell, et al. Electroencephalographic cordance patterns distinguish exceptional clinical responders with fibromyalgia to individualized homeopathic medicines. Journal of Alternative and Complementary Medicine 2004; 10 (2): 285-299. 37) Heiner Frei, André Thurneysen. Treatment for hyperactive children: homeopathy and methylphenidate compared in a family setting. British Homeopathic Journal 2001; 90: 183–188. 38) VLMT is the German version of the Rey auditory verbal learning test (RAVLT). 39) Heiner Frei, et al. Homeopathic treatment of children with attention deficit hyperactivity disorder: a randomised, double blind, placebo controlled crossover trial. European Journal of Pediatrics 2005; 164 (12): 758-767. 40) David L. Sackett, John E. Wennberg. Choosing the best research design for each question. British Medical Journal 1997; 315 (7123): 1636. 41) Jan P. Vandenbroucke. Benefits and harms of drug treatments: observational studies and randomised trials should learn from each other. British Medical Journal 2004; 329 (7456): 2-3. 42) David Evans. Hierarchy of evidence: a framework for ranking evidence evaluating healthcare interventions. Journal of Clinical Nursing 2003; 12 (1): 77-84. 43) David Atkins. Creating and synthesizing evidence with decision makers in mind: integrating evidence from clinical trials and other study designs. Medical Care 2007; 45 (10): S16. 44) David L. Sackett, John E. Wennberg. Choosing the best research design for each question. British Medical Journal 1997; 315 (7123): 1636. 45) Kjell Benson, Arthur J. Hartz. A comparison of observational studies and randomized, controlled trials. New England Journal of Medicine 2000; 342 (25): 1878-1886. 46) John Concato, Nirav Shah, Ralph I. Horwitz. Randomized, controlled trials, observational studies, and the hierarchy of research designs. New England Journal of Medicine 2000; 342 (25): 1887-1892. 47) Kjell Benson, Arthur J. Hartz. A comparison of observational studies and randomized, controlled trials. New England Journal of Medicine 2000; 342 (25): 1878-1886. 48) John Concato, Nirav Shah, Ralph I. Horwitz. Randomized, controlled trials, observational studies, and the hierarchy of research designs. New England Journal of Medicine 2000; 342 (25): 1887-1892. 49) Jason Grossman, Fiona J. Mackenzie. The randomized controlled trial: gold standard, or merely standard?. Perspectives in Biology and Medicine 2005; 48 (4): 516-534. 50) David Atkins. Creating and synthesizing evidence with decision makers in mind: integrating evidence from clinical trials and other study designs. Medical Care 2007; 45 (10): S16. 51) A. D. Oxman, J. W. Feightner (for the Evidence Based Care Resource Group). Evidence-based care. 2. Setting guidelines: how should we manage this problem. Canadian Medical Association Journal 1994; 150: 1417-23. 52) Andrew D. Oxman, GRADE Working Group. Grading quality of evidence and strength of recommendations. British Medical Journal 2004; 328 (19): 1490-1494. 53) David Atkins. Creating and synthesizing evidence with decision makers in mind: integrating evidence from clinical trials and other study designs. Medical Care 2007; 45 (10): S16. 54) D. S. Spence, E. A. Thompson, S. J. Barron. Homeopathic treatment for chronic disease: A 6-year, university-hospital outpatient observational study. Journal of Alternative and Complementary Medicine 2005; 11: 793–798. 55) Claudia M. Witt, et al. How healthy are chronically ill patients after eight years of homeopathic treatment? Results from a long term observational study. BMC Public Health 2008; 8 (1): 413. 56) Harald Walach, et al. 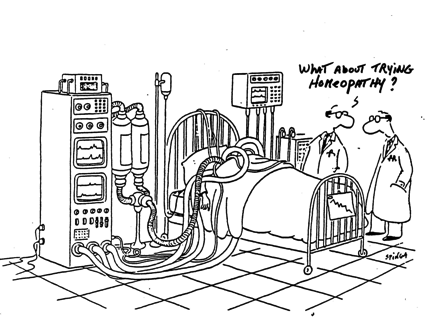 Research on homeopathy: state of the art. Journal of Alternative and Complementary Medicine 2005; 11 (5): 813-829. 57) Michael E. Dean. The Trials of Homeopathy: Origins, Structure, and Development. Essen: KVC Verlag, 2004. 58) Gudrun Bornhöft, Peter F. Matthiessen. Homeopathy In Healthcare: Effectiveness, Appropriateness, Safety, Costs: an Hta Report on Homeopathy As Part of the Swiss Complementary Medicine Evaluation Programme . Each, 2011. 59) David Didier Roth. Clinique homoeopathique; ou, Recueil de toutes les observations pratiques publiées jusqu’à nos jours. Tomes I-IX. Paris: Baillière, 1836-1840. 60) N. C. Hill, Lise Frappier-Davignon, Brenda Morrison. The periodic health examination. Canadian Medical Association Journal 1979; 12 (9): 1193-1254. 61) Anastasio Alvarez Gonzalez. Guérison d’un case de rage. Bulletin de la Société Médicale Homoeopathique 1864-1865; 5: 740-763. 62) Anastasio Alvarez Gonzalez. Historia Clinica de un Caso de Rabia Declarata. Madrid: Imprenta de Vicente, y Lavajos, 1864. 63) E. Plantureux. Recherche sur le traitement de la rage et de diverses maladies par l’homoeopathie. Homoeopathie Française 1950; 37: 217-226. 64) David A. Greenberg, Michael J. Aminoff, Roger P. Simon. Clinical Neurology. 5th edition. McGraw-Hill/Appleton & Lange, 2002. 65) Michael E. Dean. The Trials of Homeopathy: Origins, Structure, and Development. (Essen: KVC Verlag, 2004), 101. 66) Abraham Lincoln. In The Collected Works of Abraham Lincoln. Edited by Roy P. Basler. Volume 3. (Rutgers university Press, 1953), 81. 67) Gordon H. Guyatt, et al. Rating Quality of Evidence and Strength of Recommendations: What is “quality of evidence” and why is it important to clinicians? British Medical Journal 2008; 336 (7651): 995-998. 68) Gordon H. Guyatt, et al. Rating quality of evidence and strength of recommendations: GRADE: an emerging consensus on rating quality of evidence and strength of recommendations. British Medical Journal 2008; 336 (7650): 924-926. 69) Joel Shepperd. Hahnemann’s pure method of science. Simillimum 2002; 15: 66-72. This article is available here: http://www.centerforintegralhealth.com/papers/hannemann.htm#_ednref4 . Two excellent references to Goethe’s way of science are: 1) H. Bortoft. The Wholeness of Nature. New York: Lindisfarne Press, 1996. 2) David Seamon, Arthur Zajonc. Goethe's Way of Science. New York: SUNY Press, 1998. 70) William Osler. The Principles and Practice of Medicine. 8th ed. (New York and London: D. Appleton and Company, 1912), 96. 71) There is one exception to this separation of the cases of pneumonia with the ones that occurred during the 1918-1920 influenza pandemic, which is the case cohort reported by G. Harlan Wells covering the period of 1906 to 1921 at the Hahnemann Hospital in Philadelphia, and did include an indefinite number of cases of pneumonia with influenza. Rather than boasting the results obtained by homeopathy, it diminishes them, as it was mentioned that many cases admitted during the pandemic were in a moribund state. 72), 72), 72), 72), 72), 72), 72), 72), 72), 72), 72), 72), 72), 72), 72), 72), 72), 72) Willis A. Dewey. Editorials. Pneumonia and its treatment. Medical Century 1912; 19: 250-253. 73), 73), 73), 73), 73), 73), 73), 73), 73), 73), 73), 73), 73), 73) Henri de Bonneval. Considérations sur l’homoeopathie. (Bordeaux: Imprimerie Adrien Bousin, 1881), 19-22. 74), 74), 74) Krüger-Hansen. Ueber das Heilverfahren bei Pneumonien. Medicinischer Argos 1842; 4: 341-361. 75), 75), 75), 75), 75), 75), 75) J. Greenwood, R. H. Candy. The fatality of fractures of the lower extremity and of lobar pneumonia of hospital mortality rates, 1751-1901. Journal of the Royal Statistical Society 1911; 74: 363-405. 76), 76), 76), 76), 76) William Osler. The mortality of pneumonia. University Medical Magazine 1888; 1: 77-82. 77), 77) Samuel Henry Dickson. Essay on Pneumonia. In Studies in Pathology and Therapeutics. New York: William Hood & Co., 1867. 78), 78), 78), 78), 78), 78) O. Sturges, S. Coupland. The Natural History and Relations of Pneumonia. 2nd edition. London: Smith, Elder & Co., 1890. 79), 79) William Osler. The Principles and Practice of Medicine. 8th ed. New York and London: D. Appleton and Company, 1912. 80), 80) Russell L Cecil, Horace S. Baldwin, Nils P. Larsen. Lobar pneumonia: A clinical and bacteriological study of two thousands typed cases. Archives of Internal Medicine 1927; 40: 253-280. 81) In the statistics of the London Hospital, cases from broncho-pneumonia have been excluded, which tend to have a higher mortality rate particularly in young children. Osler said, “Primary acute broncho-pneumonia, like lobar form, attacks children in good health, usually under two years. … The death rate in children under five has been variously estimated at from 30 to 50 per cent.” (William Osler. The Principles and Practice of Medicine. ( New York: D. Appleton and Company), 1912, 102, 106. 83), 83), 83), 83), 83), 83) Henri de Bonneval. Considérations sur l’homœopathie. (Bordeaux: Imprimerie Adrien Bousin, 1881), 19-22. 84), 84), 84), 84), 84), 84), 84), 84), 84), 84) Willis A. Dewey. Editorials. Pneumonia and its treatment. Medical Century 1912; 19: 250-253. 85), 85) R. del Mas. Thirty cases of pneumonia. Homoeopathician 1914; 4: 53-54. 87) G. Harlan Wells. A study of the comparative value of the homeopathic treatment and other methods of treatment in lobar pneumonia. Journal of the American Institute of Homeopathy 1922-1923; 15: 541-550. 88) Jas. Railey. Discussion. A study of the comparative value of the homeopathic treatment and other methods of treatment in lobar pneumonia. Journal of the American Institute of Homeopathy 1922-1923; 15: 541-550. 89) G. Harlan Wells. A study of the comparative value of the homeopathic treatment and other methods of treatment in lobar pneumonia. Journal of the American Institute of Homeopathy 1922-1923; 15: 541-550. 90) W. H Hanchette. Discussion. A study of the comparative value of the homeopathic treatment and other methods of treatment in lobar pneumonia. Journal of the American Institute of Homeopathy 1922-1923; 15: 547. 91) Alfred Pulford, Dayton Pulford. Homoeopathic Leaders in Pneumonia. (Published by the authors: Dayton, Ohio, 1928), 5. 92) P. P. Wells. Addresses, etc. Homœopathic Physician 1885; 5: 414. 93) Pneumonia Fact Sheet. American Lung Association. October 2003. 94) Centers for Disease Control. MMWR Prevention and Control of Influenza: Recommendations of the Advisory Committee on Immunization Practices (ACIP), 2007; 56 (July): 1-54. 95) T. Welte, A. Torres, D. Nathwani. Clinical and economic burden of community-acquired pneumonia among adults in Europe. Thorax 2012; 67 (1): 71-79. 96) Sherry L. Murphy. Deaths: Final data for 1998. National Vital Statistics Reports 2000; 48 (11): 25. 97) Donna L. Hoyert, Jiaquan Xu. Deaths: preliminary data for 2011. National Vital Statistics Reports 2012; 61 (6): 28. 98) Pneumonia. WHO April 2013: Fact sheet N°331. 99) M. Gareene, C. Ronsmans, H. Campbell. The magnitude of mortality from acute respiratory infections in children under 5 years in developing countries. World Health Statistics Quarterly 1992; 45 (2-3): 180-191. 100) M. J. Fine, et al. Prognosis and outcomes of patients with community-acquired pneumonia. A meta-analysis. JAMA 1996; 275: 134-141. 104) M. J. Fine, et al. Prognosis and outcomes of patients with community-acquired pneumonia. A meta-analysis. JAMA 1996; 275: 134-141. 105) Pneumonia Fact Sheet. American Lung Association. December 2012 (http://www.lung.org/lung-disease/influenza/in-depth-resources/pneumonia-fact-sheet.html). 106) T. M. File, T. J. Marrie. Burden of community-acquired pneumonia in North American adults. Postgraduate Medicine 2010; 122: 130-41. 107) M. J. Fine, et al. Prognosis and outcomes of patients with community-acquired pneumonia. A meta-analysis. JAMA 1996; 275: 134-141.